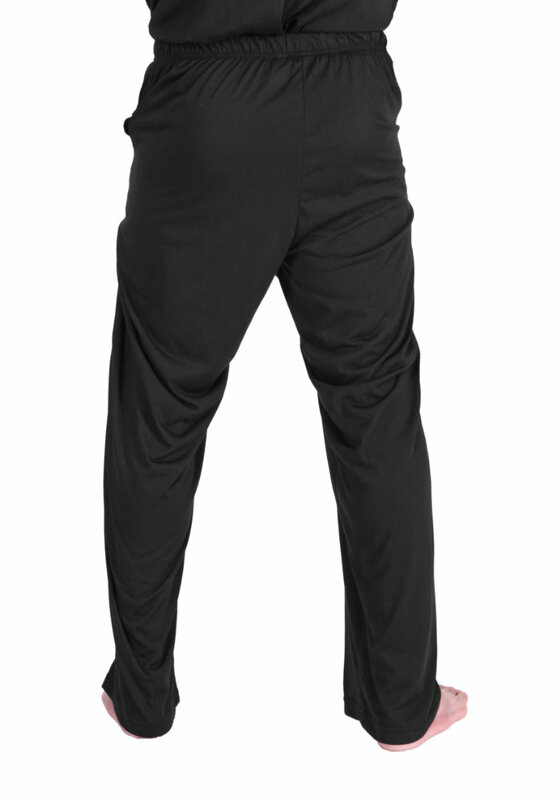 Style #T4913 For any man who struggles with night sweats and overheating, Cool-jams™ offers Men's Moisture-Wicking Pants that will quickly become a staple in your nighttime wardrobe. These stylish, comfortable pants look just like your classic pajama bottoms with side seam pockets, complete with a loose fit, elastic waist and a button fly at their front. Unlike typical pajamas, however, these men's pajamas for night sweats are made of our quick drying Cool-jams™ performance fabric that wicks away moisture and even eliminates the uncomfortable body odor caused by night sweats. 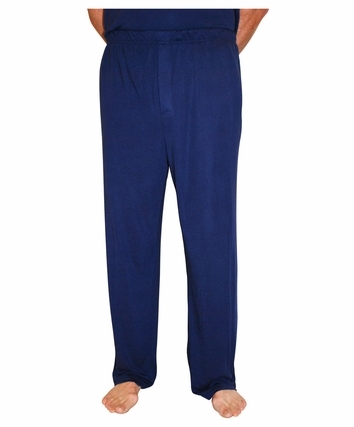 Choose from a variety of colors and sizes in our men's moisture-wicking pajama pants to create complete set with any of our other T-shirts, button-downs shirts and long-sleeved shirts. 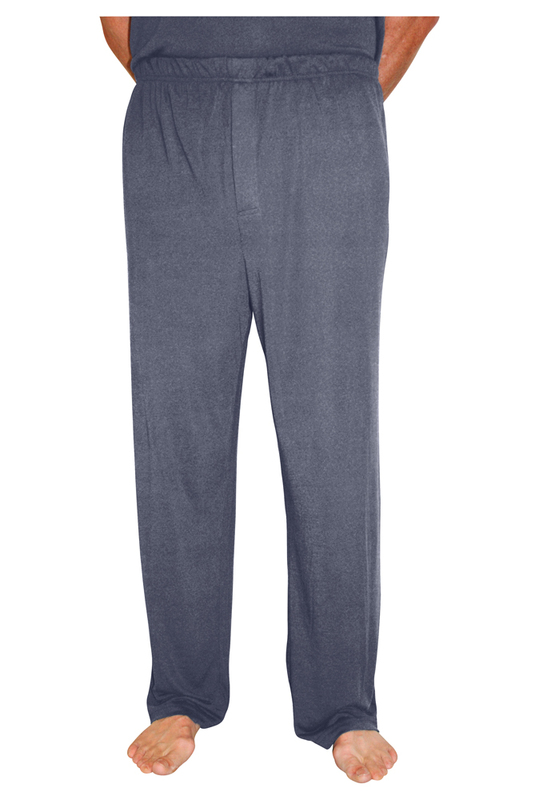 If you're a frequent traveler, the lightweight, wrinkle-resistant properties of these men's wicking sleep pants even make them ideal for tossing in a suitcase without taking up space. Pant inseam length 31". Care instructions: Wash your men's moisture-wicking pants in cool or warm water on gentle cycle. Avoid using fabric softener because it will minimize the wicking properties of the fabric. Tumble drying won't damage the men's pajamas for night sweats, but can sometimes create static. Chest 34-38 in. 39-41 in. 42-45 in. 46-49 in. 50-53 in. Waist 30-32 in. 32-34 in. 36-38 in. 40-42 in. 44-46 in. Hip 36-38 in. 39-42 in. 43-46 in. 47-50 in. 51-54 in. Great quality and they definitely keep you cool. They have also been washed multiple times and still look brand new. My husband has both the navy and the steel colors and loves them! The size large is generously sized for sleeping and the material is super silky smooth. I have the nightgowns in various lengths and love them as well as you never feel overheated. They wash beautifully and easily. I have a closet full of various styles of Cool-jams and love every item. They are soft against my skin, keep me cool at night, and wash well. This request was for me to review one of the men�s items I purchased. My husband already has a couple pairs and likes them. This year everyone in my immediate family is getting multiple sets of Cool-jams for Christmas. I�m sure they will love them as much as I do. On my second set of wicking pants and long sleeve top. My old set is threadbare with a hole in the elbow, only because I've worn them so often. Got my first for a trip to Fr. Polynesia where there was no A.C. Worth every penny. I got a pair of these in 2012 and loved them, a bit long, but comfortable. I traveled a lot and they were compact and comfortable under many conditions, camping to hotels. This new pair has a different waist band that is just kinda weird, bunchie. The length is nice and they sleep like shorts. They were comfortable sleeping on a hot southern night. Exactly what I wanted. Getting ready for a trip to Europe and these pajamas will be perfect. Comfortable, will dry quickly when washed. Material is nice and light. However, the waist band construction is where a piece of 3/8 inch elastic is placed in a 3/4&quot; waist band slot. The elastic settles to the bottom and the top flips over. Merchant's comment: You might try hanging to dry rather or low tumble drying. Sometimes aggressive drying can cause the elastic to fold. Superior product and service that exceeded all my expectations. I recommend Cool-Jams to all my friends. 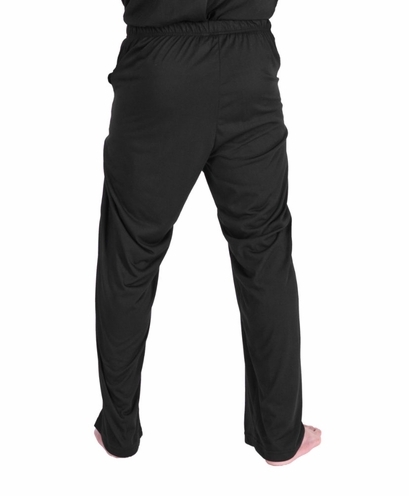 My husband isn�t a pj guy but he likes these for travel. Even asked for a second pair. My boyfriend has had problems with night sweats since before we started dating. He had trouble sleeping comfortably because of how hot and sweaty his legs were and I couldn't touch him during the night without making him even hotter. I got these as a Christmas present for him and he loves them. Now he and I can both sleep comfortably together. He wore them 5 days in a row and insists that he cannot go back to wearing any other pajama pants. I will be ordering more of these! Comfortable material and it fit just as I had hoped. My husband couldn't be more thrilled. He says these are the coolest pajamas he's ever had. He sleeps warm and says he's never been drier. Great pajama for travel and cool sleeping. I'll purchase again. Very comfortable and well made. I was worried about the length but the fit is good. The best thing though is the cool and soft fabric you use.